Bear Mace is an important tool to have in the outdoors. Personal safety needs should always be a top priority, regardless of what setting surrounds you. One of the most adaptable forms of protection is a powerful pepper spray. While most people think of this line of defense as common in urban city settings, it can be just as helpful in the often dangerous outdoors, such as a national park or on jogging trails where a charging bear may attack. If you are unprepared to protect yourself against such attacks, you may pay the ultimate price. See this recent news story. always carry some pepper spray in bear country. We are proud to offer a variety of bear spray options to protect yourself from attacking bears. We proudly carry the top brands for personal protection, such as Sabre Frontiersman, Mace Bear Spray, and Guard Alaska Bear pepper spray. These styles also allow for a quick response capability because personal safety devices are worthless if they aren�t easy to access and deploy. All of these brands have been field tested effective and are EPA approved. WE encourage anyone spending time in bear country to think about bear safety and recommend carrying bear spray in a hip or belt holster where it will be immediately accessible. Perfect for joggers on a trail or the day-to-day errands, these sprays will keep you safe on the go. 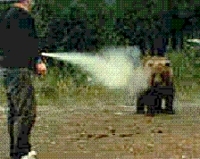 When dealing with attackers of the non-human type, studies have shown bear mace to be a highly effective solution. According to Outside Online, the use of bear mace yielded a 98 percent success rate of avoiding a bear attack during aggressive bear encounters. Perfect for fending off a variety of wild animal attacks, including bear, wolf, and dog, these sprays can make the difference between a wonderful weekend in the woods and a terrifying, life-threatening situation. Many people forgo the extra protection of bear mace because encounters and attacks are usually a rare occurrence, but with unpredictable, powerful animals like bears, it is definitely better to be safe than sorry. We are honored to be your source for all your personal safety needs and would be happy to answer any questions you may have about these sprays!